The synod had originally been intended to be held at Ancyra, but its location was moved by Constantine to Nicea (much closer to the imperial headquarters in Nicomedia) so that he might be able to participate more easily. The First Council of Nicea assembled according to tradition on May 20 of 325. Earlier in the year, there had already been a council at Antioch, presided over by St. Hosius of Cordoba, which condemned Arianism and its followers, even explicitly naming Eusebius of Caesarea (who is believed to have waffled somewhat on the question). When Constantine convened the council at Nicea, he did so primarily out of a desire to have a unified Empire rather than in an attempt to affect Church doctrine. After the initial speeches by the emperor, Hosius is generally believed to have presided at the council, summoned on the scene by the emperor himself, who had retained him as theological advisor. Fr. Alexander Schmemann writes in his Historical Road of Eastern Orthodoxy that Constantine intended the synod to be "the symbol and crown" of his victory over Licinius and the reunification of the Empire (p. 76). In his opening address, St. Constantine describes disputes within the Church as "more dangerous than war and other conflicts; they bring me more grief than anything else" (ibid., p. 77). Eusebius of Nicomedia first submits an Arian creed for the delegates to consider, and it is rejected immediately. Eusebius of Caesarea then submits a baptismal creed native to Palestine for consideration. It is this latter creed that many historians regard as being the essential framework for the Nicene Creed, though many also regard the creed issued at the earlier Antiochian council to be the basis for Nicea's creed. The Palestinian creed had included the Biblical phrase "Firstborn of all creation" in its description of Christ, but that phrase does not appear in the Nicene Creed, probably because, taken out of its context in the Apostle Paul's letter to the Colossians, it could be interpreted in an Arian manner. This phrase gets replaced with the famous homoousios, a philosophical term meaning that the Son of God is of one essence with the Father. It is particularly interesting that this term was used, despite it previously having been employed by the heretical Sabellians (notably Paul of Samosata) in the 3rd century during their conflict with St. Dionysius the Great. As with much terminology from philosophy, however, the Church Fathers co-opted homoousios and gave it a new, Orthodox meaning. It was originally introduced at Nicea by Hosius (or possibly even Constantine), then supported by "a small group of bold and far-sighted theologians who understood the inadequacy of merely condemning Arius and the need to crystallize Church tradition in a clear concept" (Schmemann, p. 78). Besides the basic format of the Creed (see Nicene Creed), four explicitly anti-Arian anathemas were attached, as well. All the bishops at the council signed the Creed except for two, Theonas of Marmarica and Secundus of Ptolemais, who were subsequently deposed by the Church and then exiled by the emperor, along with Arius, who also refused to accept the decrees of the council. Schmemann remarks regarding the exiles that Constantine was "thus again confusing the judgment of the Church with that of Caesar" (p. 79), recalling perhaps the previous unfortunate use of his civil power that St. Constantine had exercised when he persecuted the Donatists. 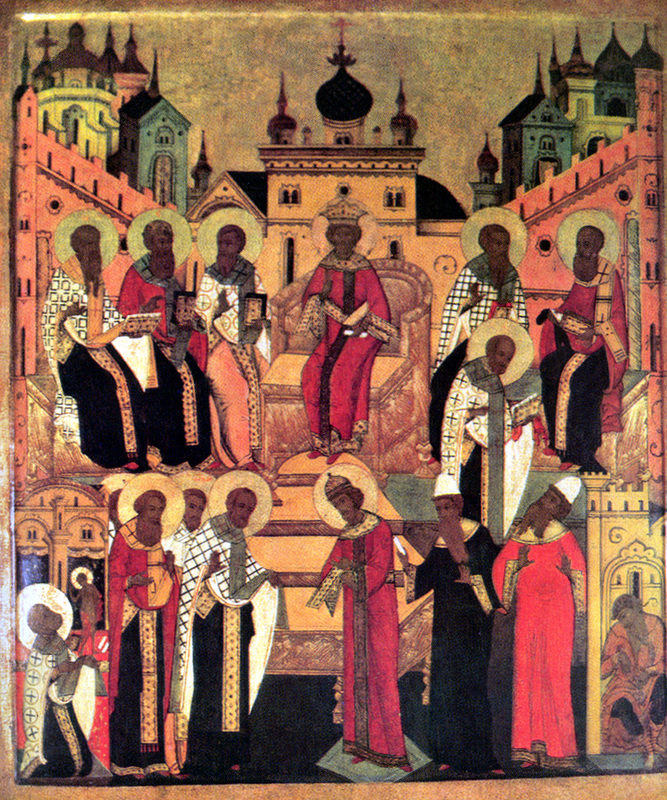 Besides the question of Arianism, the First Ecumenical Council also addressed a number of other concerns. Of particular note is the matter of the Paschalion, the method for the calculation of the celebration of Pascha. Up to this point there had been a number of different methods for determining Pascha's date, but at Nicea the bishops assembled there chose to accept the Alexandrian practice of making a calculation independent of the Jewish Passover, stipulating also that the Paschal celebration had to follow the vernal equinox. They thus rejected the Antiochian practice of making reference to Jewish reckoning when choosing the day of Pascha's celebration. Alexandria was the obvious choice for deference in this matter, as the city had long been renowned for the accuracy of its astronomers. To this day, the Pope of Alexandria retains a title which reflects this choice at Alexandria, sometimes translated as "Master of the Universe," but essentially referring to the ability to judge the astronomical state of the cosmos. A list of bishops at the council exists, including about 230 names, though there are indications that the signature lists are defective. St. Athanasius of Alexandria puts the number at 318, which is regarded as a mystically significant number, as in Genesis 14:14, the number of servants whom Abraham (then still named "Abram") took with him to rescue his nephew Lot. Only a few bishops from the West were present (a pattern common to all the Ecumenical Councils): Marcus of Calabria, Nicasius of Dijon, Domnus of Stridon, Hosius of Cordoba, and Caecilian of Carthage. Pope St. Sylvester I of Rome was represented by two of his priests. A number of renowned Eastern saints were also present: besides Athanasius the Great were Nicholas of Myra, Spyridon of Trimythous, Alexander of Alexandria, and Paphnutius of Egypt.